Medals Awarded / Medalau a ddyfarnwyd: Africa Star, War Medal 1939-45, 1939-45 Star and a medal for Military Efficiency. Died aged 24 on 29th December 1941 in Beirut as the result of an accident. (His sister believes that some gates fell on him). Stanley lived in Brookside Crescent, Northop Hall. His father Bruce worked at Summers’ Steel works and was the chief ARP warden in Northop Hall. His mother was Elizabeth Jane Acton and his little sister was Joan. 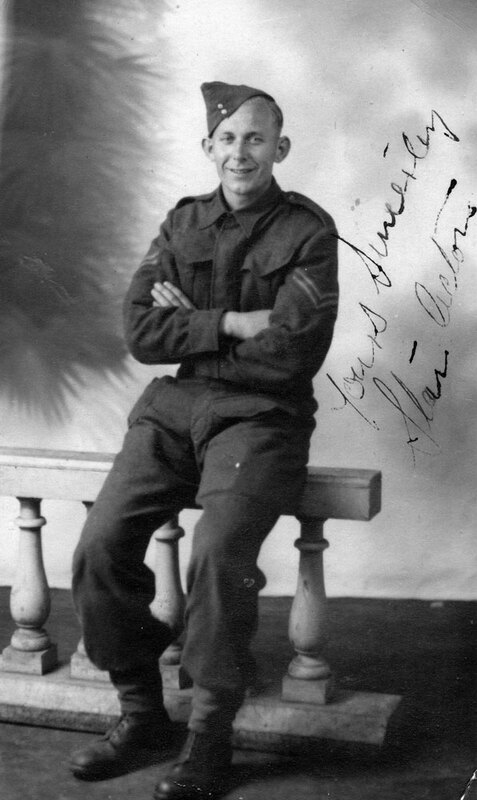 After leaving school, Stanley, like his father worked at Summers’ Steel Works but he enlisted in the army in December 1939 when he was 22 years old. He served in France until 1940 when he was repatriated from Dunkirk. He spent the next ten months in Blackpool and then was sent in December 1940 to the Middle East. The following December he suffered his accident and died. His sister Joan who was twelve at the time, remembers vividly the trauma for the family when the news was received. Bruce Acton, Stanley’s father was chairman of Northop Hall’s ‘Welcome Home Committee’ which must have been a sad and very difficult irony to endure. Grateful thanks to Stanley’s sister Joan Roberts (nee Acton) for sharing these photographs and details with us. Joan says ‘hello’ to all her friends in Northop Hall and looks forward to her next visit. This is the back of the above photograph. As we can see he had it taken at the ‘While U Wait Studios’ in Blackpool. What is especially interesting, is that it contains a good luck message, a stamp and the autograph of Reginald Dixon who was the very popular Tower Ballroom organist whose regular broadcasts to the nation were heard on the BBC wireless.